When we started making skid plates and crash bars for the Suzuki V-Stroms, there was a lot of positive feedback about our stronger bars, our beefy materials, and the seamless connection between the two pieces. As a new company, you know you’re doing something right when people are asking for more products. We quizzed Strom owners on the forums about what they were looking for in a frame slider, did some research, and after a few months of development came up with what we believe to be a good solution. Right about that time, we were also finishing work on the Ducati Multistrada 1200 crash bars, so it was a no-brainer for us to pursue a frame slider system that interfaced with both types of crash bars. 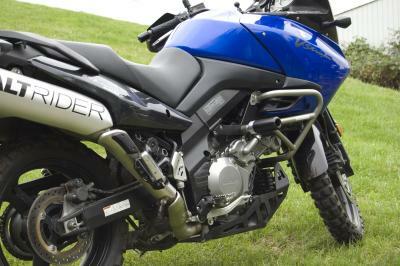 What makes the AltRider Frame Sliders different than others already available? First, the slider itself is made out of an impact and abrasion resistant plastic called UHMW. One of the problems with other common slider materials is that they are more brittle and likely to break upon impact, and potentially cause more harm than if they hadn’t been there at all. 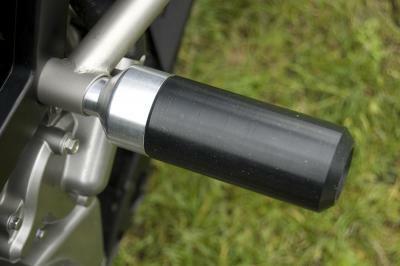 Any breakage that occurs makes for a jagged frame slider surface that is more likely to catch and flip the bike. UHMW is a good bit more impact resistant. Another reason we chose UHMW is it possesses good lubrication and wear properties. It is often used in bearings and slides in industrial machinery for those very reasons. When used to manufacture sliders, it means they’ll slide -- and can survive a longer slide than other plastics. 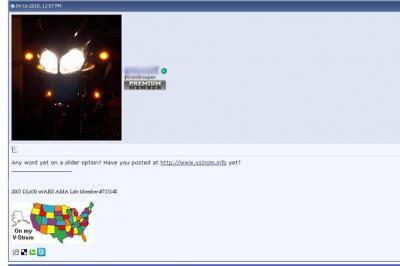 They’re also less likely to snap off or crack upon impact. 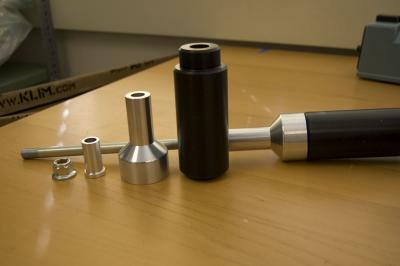 A second improvement upon other frame sliders currently available is the bolt that we use. We didn’t want to use all thread like so many manufacturers do, because the constant vibration of your bike would cause those threads to wear away at the frame. this started a long research project, because in the United States you can't find the desired 12 mm rod that is also hard enough to build the engine bold correctly. Instead, we secured 1/2 inch high strength chromoly steel rod, heat treated and tempered/annealed it, then used a centerless grind to get it down to 12 mm. We threaded the ends, and plated it in clear zinc to ensure they would stand up to the elements for years. You might be wondering why we didn't use stainless steel for this bolt. While stainless is a great option and perfect for many applications, it is nowhere near as strong as chromoly steel. 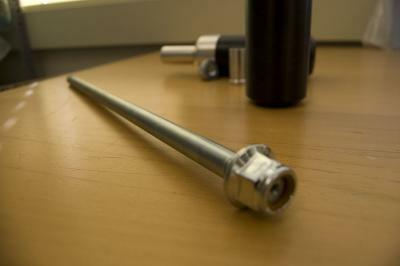 After all, your frame sliders won’t do any good if the bolt breaks, so we made it as robust as possible. The frame slider plastics fit into the billet aluminum frame slider mounts and onto the bolt, secured by zinc plated flanged M12 locknuts. These are the only frame sliders that integrate into a crash bar system. The length is ideal for ensuring the points of contact when a V-Strom goes over – the contact points are designed to be the handle bar, rear passenger peg, frame slider, and crash bars, protecting the internal parts and the fairings. And the Multistrada 1200 receives similar protection, with the contact points being the frame slider, handle bar, foot peg, passenger peg, and crash bars. Did we reinvent the frame slider? Maybe not. But we did re-imagine it – with the help of our Stromtrooper friends! – as a stronger, more durable product. 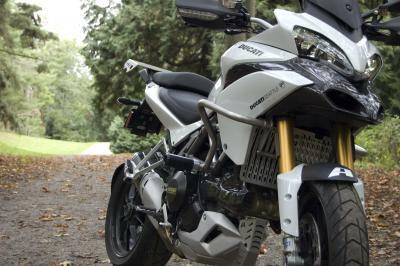 You can now check out our frame sliders for the Suzuki V-Strom 1000, the V-Strom 650, and the Ducati Multistrada 1200.